Syriza remains popular with the Greek public. But the strategies developed over the next four months will determine the party's future. In fact, the electorate seems to have understood the situation facing Syriza better than Schäuble thought. Subjected to constant blackmail, those who now govern Greece tried something that none of their predecessors had ever seriously imagined doing: negotiating as hard as possible, within the eurozone, to free their country of the austerity measures that have led to a seemingly endless depression. According to a recent poll, Syriza now has solid popular support. If elections were held tomorrow, it would get 41.3 percent of the vote — 20 points ahead of New Democracy, the right-wing opposition. But the same survey highlights an apparent paradox: 70 percent of those interviewed consider the February 20 agreement with the Eurogroup “better” or “rather better” than the previous one, but a plurality (39 percent) think that it is “definitely” or “somewhat” a continuation of the memorandums, as opposed to 31 percent who disagree, and almost as many who have “no opinion” on the question. And, indeed, support for measures that would toughen up the government’s attitude in future negotiations is higher than ever. 54 percent of respondents are now in favor of capital controls (with 52 percent opposed) and 38 percent in favor of leaving the eurozone, with 60 percent still against. Even so, the agreement in question represents a serious retreat for the Syriza government, which has been forced to make such major concessions as recognizing the debt in full; promising not to take any “unilateral measures” that might have a budgetary impact or threaten “financial stability”; and accepting the troika’s supervision (even if they have now been rebranded “the institutions”). The list of “reforms” that Greek Finance Minister Yanis Varoufakis sent to his counterparts on February 25 filled in the details: the Greek government committed to accepting planned privatizations, introducing “flexicurity” into an already deregulated labour market, and improving the quality of public services without spending any more money. Syriza’s promises before the election now seem things of the past. Of course, Greek Prime Minister Alexis Tsipras obtained four months’ respite, which should, theoretically, guarantee the country’s funding needs as well as secure its banking system. But the claims he made in his speech following the agreement, seeking to present it as a “success” and a “demonstration of the possibility for negotiation within the European framework,” hardly ring true. The government has its hands tied, unable to fulfill many of its election promises or to free the country from the hated memorandums. The result has been a paralysis that seems almost surreal for a government of the radical left, with its legislative agenda at a standstill. It has stalled or made contradictory statements with regard to almost all of the emblematic measures it had announced in its first days in office, in particular the increasing of the minimum wage; the abolition of the burdensome property taxes on the middle and working classes; and the raising of the income-tax threshold. In sum, all those things that could have provided some relief for a society that has been bled dry. Syriza has in fact been confronted with what Costas Douzinas has aptly termed “Europe’s soft coup.” This is a “soft coup” in that it uses monetary weapons and media manipulation rather than tanks (for the moment, anyway) to prevent a ruling party implementing the program for which it received a popular mandate. Worse still: if this state of affairs continues, the “time that’s been bought” — the four months provided for by the February 20 agreement — could well play against the government, leading to the erosion of its popular support and allowing the enemy to regroup and to counter-attack. More important still, there is no reason to believe that continuing with the same approach that the Greek delegation in Brussels took last month will produce any different results when it comes to the new round of talks that will begin in June. Particularly since what will then be on the table will not be a matter of temporary arrangements lasting a few months, but long-term commitments. So it didn’t take long for criticism to emerge, even at the highest levels of Syriza. 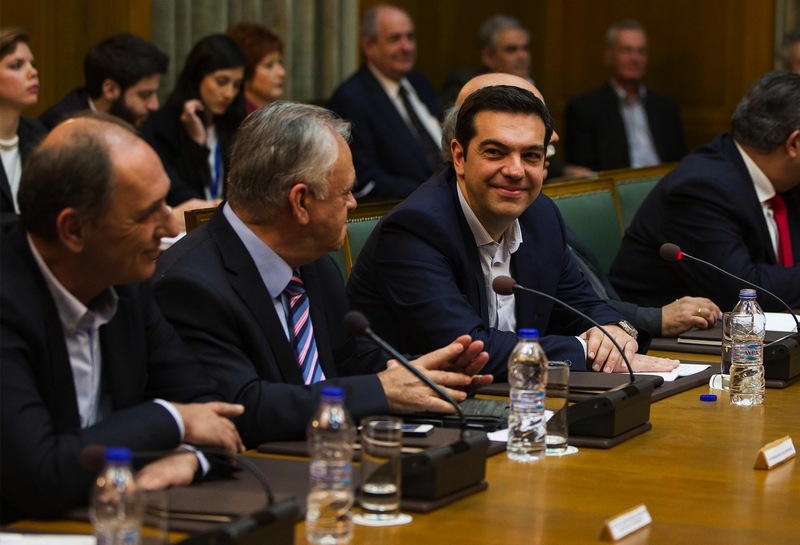 After a twelve-hour meeting of the party’s parliamentary group on February 27, in an indicative vote around a third of Syriza members of parliament said they opposed the deal. No fewer than six ministers registered their disapproval by voting “blank,” namely the four ministers from the Left Platform (Panagiotis Lafazanis, Dimitris Stratoulis, Nikos Chountis, and Costas Isyhos), as well as Nadia Valavani (deputy finance minister) and Thodoris Dritsas (deputy minister for development). The national assembly president, Zoe Kostantopoulou, went as far as voting against the agreement. This internal opposition forced Tsipras to postpone indefinitely any idea of putting the February 20 accord to a parliamentary vote, which would only have demonstrated the divisions within his own governing majority. The resistance reached a new level during the Syriza central committee meeting held last weekend. The left wing of the party, led by Minister of Productive Reconstruction Panagiotis Lafazanis, showed its strength as it got 41 percent support for an amendment rejecting both the Eurogroup agreement and “Varoufakis’s list” of reforms. In the Left Platform’s view, the government has to break out of the confines of the accords that it has signed and implement some of its key policies without first seeking permission from the institutions. And with an eye to June’s negotiations, it has proposed an “alternative plan” that doesn’t shy away from taking “unilateral” measures, including — if there is any more blackmail over the country’s financing — breaking from the euro framework. The debates have not gone unnoticed, with even the mainstream noting that this is a party divided over its strategic choices and which has little inclination to bear the fetters imposed on it by the European Union (EU) leadership. Nonetheless it seems that both Tsipras’s intervention at the central committee and the ministerial announcements that followed have sought to strike a new balance. The government is currently shifting toward a sort of “controlled disobedience” with regard to its European supervisors. Tsipras announced the imminent presentation of five new bills: for emergency measures to deal with the humanitarian crisis; rearranging the payment of tax arrears, to the advantage of lower-income taxpayers; a ban on people’s main residences being seized because of debts; the reinstatement of the public broadcaster; and the constitution of a commission of inquiry into those responsible for signing Greece up to the memorandums. The legislation seeking to resolve the humanitarian crisis has now been presented to parliament, though we ought to emphasize that this is no more than a heavily revised (indeed, downgraded) version of the “first pillar” of the Thessaloniki program, particularly as concerns the restrictive conditions for accessing the aid that will be offered. For example, Greeks below an “extreme poverty” threshold will have the right to have their electrical supply reconnected. This mark has been set at €4,800 a year for a family of four, allowing 150,000 households to benefit from this measure — half as many as originally planned in the program. The cost of this policy package as a whole has been estimated at €200 million, as opposed to the €1.8 billion total price tag for Syriza’s pre-election commitments. Even if we take off the €500 million cost of re-introducing the “thirteenth month” bonus on the minimum pension, the cost of the “Thessaloniki package” on resolving the humanitarian crisis would still amount to a total of €1.3 billion — more than six times the level of expenditure of the current program. However, we also ought to take into account the measures announced by Social Affairs Minister Dimitris Stratoulis: canceling the cuts to retirement benefits that the previous government had planned for 2015. One of the leading figures in the Left Platform, Stratoulis has also stated that he has no intention of seeking any permission from the institutions for his plans — only the finance minister has to talk to the rebranded troika. As for the minimum wage, the bill bringing it back up to its 2009 level of €751 a month, gross (in two stages — one this year, the second in 2016) as well as re-establishing collective bargaining, is expected to be released in two weeks. To complete this portrait of Syriza’s “selective disobedience,” we should mention the initiatives taken by Lafazanis, who has blocked the progress of what are without doubt three of the most emblematic examples of austerity pushed by the previous government. Namely, he has stopped the asset-stripping of the electricity company, which sought to privatize its “profitable” part; revoked approval for the open-cast gold mine at Skouries in Chalkidiki, previously handed to the mining colossus Eldorado Gold on scandalous terms; and blocked the former Athens airport’s land being handed to a holding company (set up by Greek tycoon Spiros Latsis, and backed by Qatari capital) for a derisory sum. Fortunately, Lafazanis’s audacity didn’t remain isolated. In her capacity as president of the national assembly, Kostantopoulou announced on March 4 the constitution of an international commission for the auditing of the Greek public debt after a meeting with Eric Toussaint, a well-known campaigner for the abolition of sovereign debt and spokesperson of the Committee for the Abolition of Third World Debt, who played a key role in the equivalent commission set up in 2008 by Ecuadorian president Rafael Correa. This initiative might turn out to be a virtual bomb in the process of renegotiation of the Greek debt, categorically refused so far by the EU, since it puts into question its sheer legitimacy and aims at opening up sensitive files such as arms contracts approved by previous governments or cases of corruption such the one involving Siemens, one of the top German corporations. This orientation can only further complicate Greece’s relations with the institutions — and this at a time when the economic situation is worsening considerably. Faced with a collapse in tax revenue — which could lead to a disorderly default on its debt payments — the government has announced its intention to hold off on paying back its obligations to the European Central Bank (now reaching their deadlines) in favor of honoring its debts to the International Monetary Fund. But Wolfgang Schäuble doesn’t see things the same way. In an interview he gave to the Sunday edition of Bild Zeitung , he warned the Greek leaders that any delay in paying back the debt would automatically be considered a default. He also enjoined them to immediately implement the “reforms” to which they have committed — threatening that if they do not do so, they will not get any funding at all. This threat should be taken all the more seriously because the ECB has still not lifted its restrictions on providing liquidity to the Greek banks, which are now more than ever in a critical situation. ECB President Mario Draghi even made clear that these restrictions would only be lifted if the ECB council “decide that the conditions for a successful completion of the program are in place,” at the same time as expressing his strong “reservations” over Athens’s planned reforms. In his recent declarations from Cyprus, he ruled out throwing Athens a lifeline by allowing Greek banks to buy more of the country’s short-term debt, arguing that such a move would amount to a break of the ECB rules. In sum, it seems that the outcome of this first, hard-fought round of negotiations is far from a resolution to the Greek crisis. Rather, these negotiations were just the initial stage in a prolonged confrontation between Europe’s only radical left government and an EU that has dug itself into defending the “iron cage” of neoliberal policies more than ever before. It remains to be seen if the Syriza government — but also the party itself and the social movements — will prove able to use these four months to develop an alternative strategy that can break out of this stranglehold and avoid a repeat of February’s setbacks. Stathis Kouvelakis teaches political theory at King’s College London. He formerly served on the central committee of Syriza. Syriza remains popular with the Greek public. But the strategies developed over the next four months will determine the party’s future.